NOTE: There are no wide-release DVDs coming out this week (7/21). Plot: An aging Sherlock Holmes is trying to beat time and his failing memory to figure out his final case. Ian McKellen is simply spectacular in his role as an aging Sherlock Holmes. He plays the same character over a 30 year span and absolutely nails every aspect of it. This film is very slow, but it actually fits well with the slow-moving Sherlock. It is heartbreaking to see this character that we all know and love so well struggle with the one thing that was always his super power over the rest of humanity...his brain. The film does a great job of showing Mr. Holmes's struggles, but it also shows us flashes of brilliance where we see the old Sherlock come back to life. We also begin to see the regrets that only a man like Sherlock Holmes could have, making for several moving moments throughout this film. 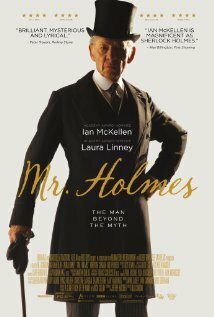 While I think that all fans of Sherlock Holmes will find this movie to be satisfactory, I think the DOWNTON ABBEY fans will especially find MR. HOLMES outstanding. Labels: Ian McKellen, Laura Linney, Milo Parker, Movie Review, Mr. Holmes, Sherlock Holmes.